Be the first to share your favorite memory, photo or story of Bridget. This memorial page is dedicated for family, friends and future generations to celebrate the life of their loved one. Miss Bridget Lynn Riley was born on July 28, 1981 in Denver, CO, she was born to David Anderson and Alice Riley. The oldest of seven kids her; her brothers, Marcus, Demar, Rober and Claudious; her sisters, Shaqueana, Jessica, Rose and Felicia. She was a happy child; Bridget was always “into things”. She loved dancing and playing music with her friends and family. Her sibilings remember that she was the best sister any one could have. Bridget was educated in the public school system; Bridget attended West Wood Elementary, Kepner Junior High and Lincoln High School. From an early relationship with Maurice Harris, Bridget was blessed with one daughter, Lexus Riley, and after many years of friendship, Bridget and Karderol became a couple. To this relationship was born one daughter, Millieana riley. She was a loving and devoted mother. The children remembered that she was caring, compassionate, funny, and always had their back. By profession Bridget was a great working woman and was known to excel in her duties. Bridget enjoyed working and was full of laughter and fun while on the job. In her free time, she enhoyed being with her family and friends, listening to music, watching movies and just kicking back. Her favorite music was old school R & B and her favorite artist was Bob Marley. Her beautiful smile, love, sense of humor and compassionate nature will be deeply missed by everyone fortunate enough to have shared a par of Bridget’s life. The sunset on the life of Miss Bridget Lynn Riley on, November 26, 2018. 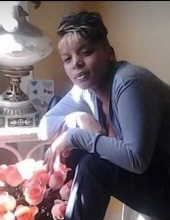 Those left to cherish her memory include her daughters, Lexus and Miliieana Riley; brothers, Marcus, Demar, Robert and Claudiopus; sisters, Shaquana, Jessica, Rose and Felicia; her mother, Alice; her grandmother, Geraldine and a host of aunts, uncles, nieces, nephews, cousins and friends. To send flowers or a remembrance gift to the family of Bridget Riley, please visit our Tribute Store. "Email Address" would like to share the life celebration of Bridget Riley. Click on the "link" to go to share a favorite memory or leave a condolence message for the family.